High Prairie’s Austin Mood-Flagg splits the Falher defence during action at the Sports Palace Jan. 24. 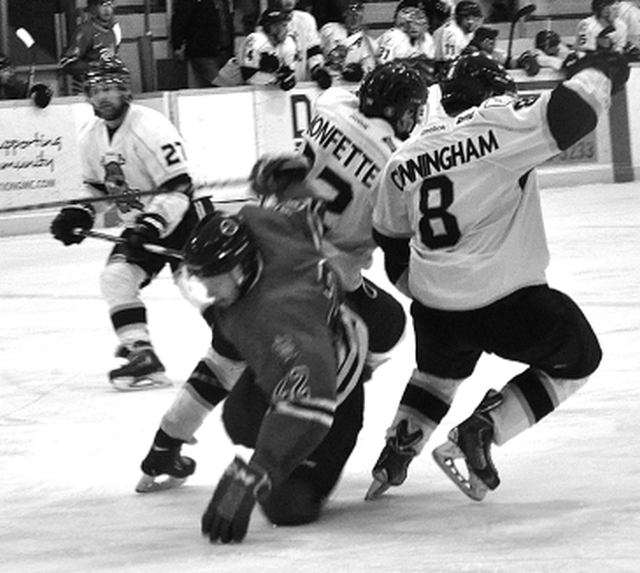 Defending on the play and crashing into each other are Kevin Monfette and Dylan Cunningham. Behind the play is Dan Aubin. Defensive woes and a short bench are putting a quick stop to any momentum the High Prairie Regals might be gaining as the NPHL playoffs approach. The Regals surrendered 10 goals in back-to-back home games last week as they prepare for a playoff series against the Falher Pirates beginning Feb. 5. The Regals lost 10-2 to the Pirates on Jan. 24 and 10-5 to the Grande Prairie Athletics Jan. 26 despite the fact the A’s brought only 11 skaters. The Pirates’ win at High Prairie clinched first place in the East Division and officially set up their playoff date with the Regals. The Pirates, who entered the game on a season high four-game losing streak, never trailed, leading 2-0 after one period and 4-2 after two. Making matters worse, and perhaps sending a message as the playoffs loom, the Pirates added six unanswered goals in the third period, including four in the final 2:56 as they rubbed salt into the wounds of a short-handed Regals team, who iced only 13 skaters. Dakota Mason, Darren Kramer and Brian Sommers each scored twice to lead the attack, with Mason scoring the second period game-winner. Pat Rowan, Dallas Brochu, Trevor Tokarz and Neil Maisonneuve added one goal each. Rocky Collins and Mason each added three helpers. Kirk Ruecker scored a first period goal for the Regals while Jamie MacMinn added the other goal in the second period. No power play goals were scored in the game. The Pirates had only one chance while the Regals went scoreless in five. Two nights later, Devin Bell and Kelvin Neustaeter each scored three goals as the visiting Athletics outgunned the Regals. The meaningless game seemed to draw little interest from the players: the A’s iced only 11 skaters for the game, the Regals 13. The A’s are locked into second place in the West Division and will play the defending champion Fort St. John Flyers in the playoffs. Nonetheless, if you liked goals, this was the game for you. The A’s took a quick 2-0 lead on goals from Neustaeter and led 3-1 in the first. A last minute goal from Lloyd AhKimNachie – his second of the game – plus two early goals in the second period gave the Regals a 4-3 lead. But the Athletics scored five straight goals in under seven minutes to take a commanding 8-4 lead after two periods. Three of the goals came in a 45-second span, one on the power play. The Regals closed the gap to 8-5 in the third and had a two-man power play shortly afterwards and hopes of rallying, but the A’s scored short-handed and it was all but over. Lyndin Lewis added two goals for the A’s with Mackenzie Caron and Morgan MacLean adding the others. Hector Lamouche and Dakota Conroy added power play goals for the Regals while Isaiah Letendre scored a short-handed effort. The Regals close the regular season with a game at Falher Jan. 31 and a home game against Manning Feb. 2.